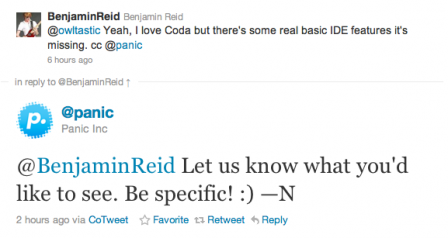 Earlier on today, I got a reply on Twitter from @panic asking what I'd like to see in their already wonderful OSX IDE, Coda. Now, I'm not one to waste an opportunity so I thought I'd note down a few things I'd like to see in future versions of Coda. Anyone working with variables (which is obviously very common in web development!) will know that once your document is larger than your screen it's a pain to keep scrolling back up and trying to remember variable names - so being able to type "$" and a list of variables that are set on the page appear, would be very welcome. Another major part of code completion that I'd like to see is when writing classes, or within a framework like CodeIgniter, all classes, functions, methods get picked up. As soon as you start tying these pop up to help you on your way. This is something I'd love to see. Being able to create a workspace, which you can assign an FTP connection to. Inside this workspace you can create multiple projects that can then have different live roots to the workspaces FTP connection. Basically allowing to easily manage sites that are set up to have a staging and live environments. At the moment this requires creating two sites in Coda and it's just messy, especially when FTP details have to change. Does what is says on the tin, but here's a good example. Well that's just a few for now, if anyone's got any to add in the comments, please do and hopefully the lovely guys at Panic will have a read and perhaps take some of these ideas into consideration. Being a long-term user of Coda, I love it greatly, and all of these points I’ve wanted for a long time. I hope Panic listens! Coda’s great but it’s long overdue for an upgrade. 1) Custom panels so that I can connect to a domain management page, or a phpMyAdmin page within Coda. Alternatively, Panic could replace the file browser view with one that only shows OPEN files – that would be damn handy. Something I never really liked about Coda (and I use it every day so don’t get me wrong, I love the application) is that opening a remote file and making changes to it does not update the local copy. I’d like to have a per-site “auto-sync” option, so that I can experiment on my remote server and then commit the changes to GIT locally. Having to download my changes is a drag, whilst working locally and manually uploading every change is twice as painful. 3) Oh and while we’re on that subject, native support for GIT would be nice! 5) Code hints could be vastly improved. They never seem to accurately represent the function I’m using and the times when they could be useful, say reminding me what order the args for PHP substr command are in, they’re just never there for me. I hope that the fact they are polling users is an indication that they’re getting ready to release an update.